Creating scenarios, which are after all imaginary stories highly unlikely to match the reality that will actually unfold, is just the beginning of creating a scenario analysis that will have any long-term value. If the scenarios are thought of as broad guidelines into the future, then plotting past events on the scenario grid in temporal sequence can both hint at where things are moving and, as new events are added, indicate when things take a turn. What one imagines the future may look like (traditional scenario analysis) is far less important than watching how reality winds its way from one scenario to another (scenario evolution). The new concept of scenario evolution constitutes the first big step toward transforming scenario analysis from an unscientific way of provoking the imagination into a rigorous analytical methodology (a more profound second step is the integration of scenario analysis with system dynamics, introduced on “Page V. System Dynamics” of this site). This technique can be expanded by including anticipated events that would confirm movement in the direction of each of the scenarios. The basic idea is to place dated events at points on the grid where they seem to fit, to see if the sequence of events suggests any clear trends. The above chart provides an example of my own novel approach to how the concept of scenario evolution could be implemented graphically for the simplest scenario analysis case: a scenario based on the greatly simplified case that has only two driving forces, here the “degree of unity” and the “degree of justice.” As far as I am aware, no other effort to do this has been attempted. This example was taken from a scenario analysis of Israeli-Iranian relations. Although obviously a very simple graphical technique for recalling antecedent events, anyone familiar with American media coverage of the history of the Israeli-Palestinian conflict should immediately recognize the significance of plotting key events from a cursory inspection of this graph. Hamas’ 2006 election victory, the seminal event in the recent history of that conflict, in that it represented the shift from violence to participation–with Israeli and U.S. support–in the democratic process, is typically “forgotten” in the standard U.S. media portrayal of the conflict, so one misses the whole process of what has happened since that point. Methodologically, this graph represents a simple application of what could be made as detailed as necessary, starting, say, with a simple overview graphic such as this one and then proceeding to graphs representing shorter and shorter time periods in greater and greater detail. s that appear to be in part a function of that force, a step that moves the analyst in the direction of system dynamics (i.e., the critical search for the underlying dynamics that cause behavior). Note that to employ this technique, one does not list events in any time sequence; rather, one places events where they appear to fit analytically. In this case, the events almost all constitute examples of forceful conflict resolution strategy. That already provides useful information, but the real payoff occurs if events happen to end up being in relatively clear time sequence because that would indicate evolution of the state of reality. Thus, from the perspective of scenario evolution, the key analytical question that this chart addresses is the degree to which a clear temporal sequence occurs as one moves toward one extreme or the other. 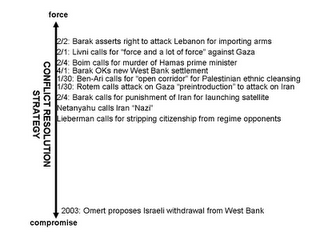 This chart is taken from an analysis of Israel’s conflict resolution strategy. The red arrow from the gray scenario to the red scenario shows scenario evolution. Going the next step, to a scenario based on three driving forces, the number of alternative scenarios is doubled, as shown in the “Scenario Evolution” chart, where the red arrow indicates the flow of time, with the positioning of the arrow here indicating that the original scenario that represented reality (or the analyst’s forecast) was in the gray scenario (faith, negotiations, and benign environment) but over time has shifted to the highly dangerous red octant, a scenario characterized by faith, force, and a challenging environment. This chart comes from a study of the use of force in international relations. The red arrow shows the evolution of Pakistan’s stance toward democracy forces and tribal regions in late 2007. 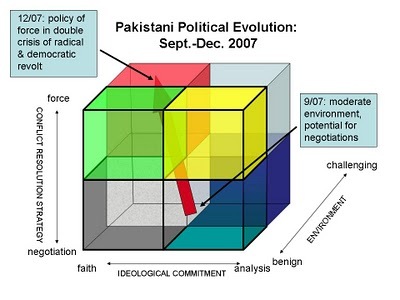 The second example, showing the political evolution of Pakistan, illustrates the addition of a simple story line. This appears simple; such is the power of a picture. In fact, remembering the path that an adapting actor has taken even over recent months can be very difficult, leaving not just the public but also policy-makers with the erroneous impression that the adversary is an implacable enemy who never responds to friendly initiatives. The difficulty is particularly great when the adversary’s policies evolve in a desired direction and then revert back to their prior position, something that occurred only to be mostly overlooked in U.S.-Iranian relations in 2010, as illustrated in “The Evolution of U.S.-Iranian Relations, 2010.” This is an ironic and sad picture of bilateral foreign policy failure. 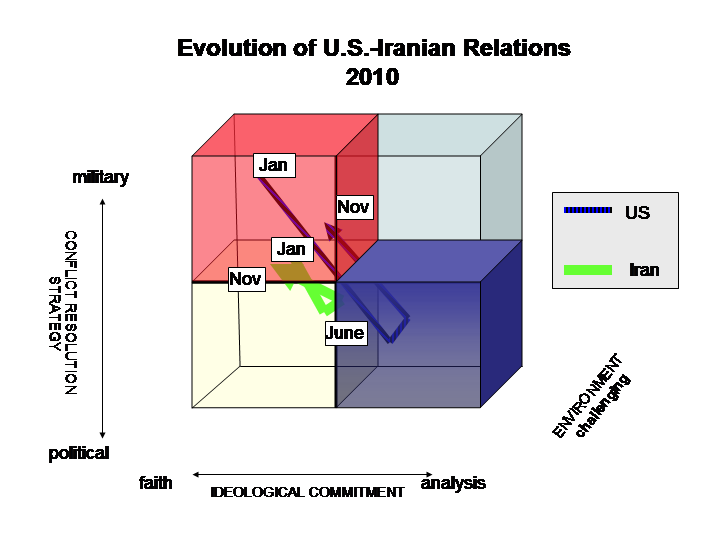 On two of the three dimensions evaluated in this scenario analysis, the attitude toward bilateral ties of both Washington and Tehran changed significantly during 2010, only to revert to the original positions. focus on how reality might transition from one scenario to another (scenario evolution). 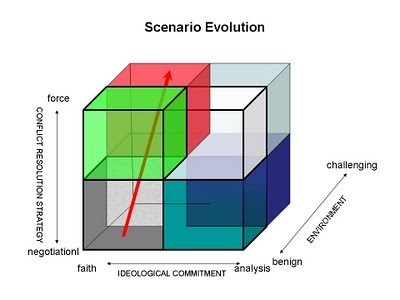 Separating the scenario boxes facilitates focusing on scenario evolution. The key to this line of reasoning is to remember that the scenarios are artificial,”ideal” types – none is likely ever accurately to represent reality. One may, for example, have a “Success” scenario and a “Failure” scenario, but reality will surely always incorporate some aspects of both success and failure. The chart below portrays the scenarios pulled apart with arrows showing the path of a storyline that moves among four different scenarios. The point here is to draw attention to the process (shown by an arrow from one scenario to another) by which behavior transitions. 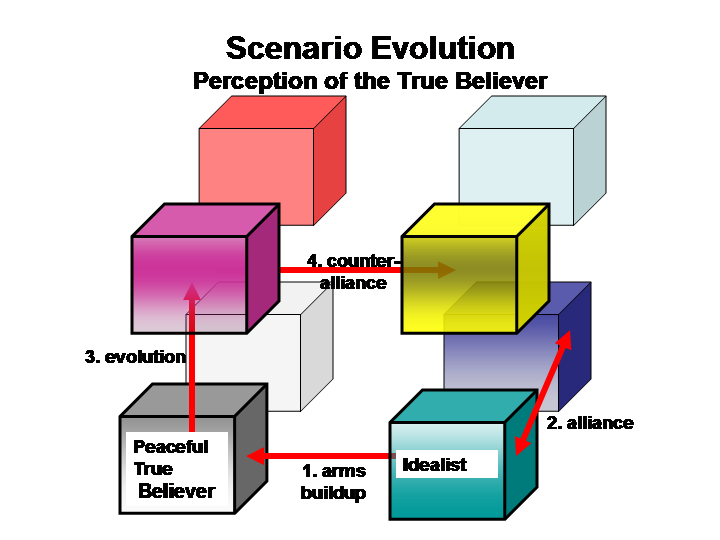 One arrow, for example, shows an arms race as the key to transition away from the “Idealist” or “Peace” scenario. Understanding the process that pushes reality from one scenario to another is key. By graphing the scenario evolution steps incrementally (e.g., assume in the above graph that the numbers on the arrows show temporal sequence), one can summarize the historical development of a complicated story. Here, the story is essentially that “it all started with an arms race…,” something that in reality is all too easy for observers to forget once tension rises, emotions take over, and busy decision-makers–who may not even have been in office during the initial stages of the process–start making assumptions about who is guilty and what intentions the adversary may have had. These graphics are samples of new techniques I am currently developing to move beyond the traditional static scenario methodology. Scenario evolution shifts the emphasis from alternative scenarios to asking how reality might shift among them, a far more realistic and thought-provoking analytical question. That such graphics can be constructed with relative ease in Powerpoint offers hope that truly powerful graphics could now be offered that would significantly enhance the ability of a student or researcher to track the changes that either have occurred or might occur in a complicated situation.